EXTREMELY RARE with contrast this superb in this variety! 1 of 3. Where is the doubling on this variety? The answer is in the numerals 19 of the date are clearly doubled. 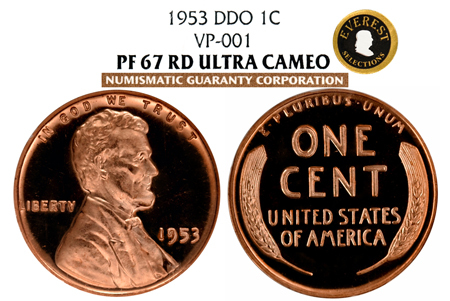 NGC has only graded 8 total examples in ALL grades of ULTRA CAMEO. There are only 3 examples certified in PF 67 RD UCAM and only 1 higher in PF 68 RD UCAM. The populations have NOT CHANGED in over 3 years! Both obverse and reverse offer incredible snow-white frosted cameo devices. Pristine spot-free, haze-free jet-black mirrored fields. THIS IS A RARE FIND FOLKS - WOW!